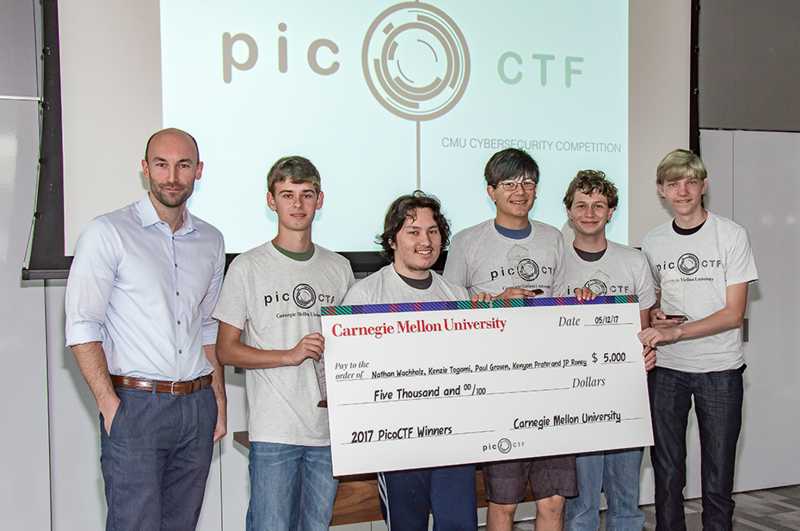 The winning team from this year’s picoCTF hacking competition visited Carnegie Mellon to receive their prize, a $5,000 check. Recognizing the need to fill the talent gap in the currently struggling cybersecurity workforce, CyLab has created a free, online competition aimed at introducing young minds to the problem-solving skills of cybersecurity. The annual competition, named picoCTF, was first launched in 2013 and has since been played by over 50,000 students from all over the world. During the competition, which typically lasts between one and two weeks, student participants hack, decrypt, reverse-engineer, and do anything necessary to solve computer security challenges created by CyLab’s competitive hacking team, the Plaid Parliament of Pwning. CyLab's outreach and awareness programs provide web-based, publically accessible tools to raise national awareness of cybersecurity threats and to promote safe and responsible online behavior to citizens at all levels equipping them to meet the demands and challenges of being responsible computer users and cybercitizens. Carnegie Mellon University and CyLab have been designated by the National Security Agency as a Center of Academic Excellence in Information Assurance Education. This certification as a center of excellence is presented in recognition of a significant contribution in meeting the national demand for information assurance education, developing a growing number of professionals with information assurance expertise in various disciplines, and ultimately contributing to the protection of the national information infrastructure. CyLab responds to the growing demand for Information Assurance Professionals by offering programs for both students and faculty. Students admitted to the Information Networking Institute (INI) graduate program in Information Security (MSIS) and the Heinz College graduate program in Information Security Policy Management (MSISPM) are eligible for participation in the Scholarship for Service (SFS) program. SFS, a scholarship for service program offered by the U.S. of Personnel Management, provides full financial assistance to a few highly qualified applicants each year who satisfy all the requirements. View detailed information about the SFS program in reference to admission to INI graduate programs. The Information Assurance Capacity Building Program (IACBP) is an intensive, in-residence summer program to help build Information Assurance education and research capacity at colleges and universities designated as Minority Serving Institutions - including, Historically Black Colleges and Universities (HBCUs) and Hispanic Serving Institutions (HSIs). The IACBP has produced tremendous results, ranging from the creation of new courses, certifications, and degree programs to the development of grant proposals and publications. One participant has been designated as a Center of Academic Excellence in Information Assurance. This material is based upon work supported by the National Science Foundation under Grant No. 0830879.